Immunogenicity can potentially lead to reduced efficacy through rapid clearance or neutralization of the drug, or toxicity due to cross-reaction with proteins in the body, which can have catastrophic consequences for the patient. Antibody humanization can reduce the immunogenicity of monoclonal antibodies derived from xenogeneic sources and to improve their activation of the human immune system by replacing non-human antibody frameworks with human ones. It is a very important step in therapeutic antibody discovery process. In some cases that the obtained leads have relative low affinity (such as phage library campaign), or the final application needs extremely high affinity, affinity maturation is required to preserve the epitope specificity and functional activity of the antibody and boost potency to the desired level. In addition, it can be useful to remove potential modification sites for improved developability. As a one-stop supplier for therapeutic antibody discovery and development, GenScript is proud to offer integrated antibody humanization and affinity maturation service. Combining in silico CDR-grafting, structure-based back mutation, and, supported by our patented FASEBA(Fast Screening for Expression, Biophysical-properties and Affinity) screening, Biacore Surface Plasmon Resonance platform and functional assay platform, the antibody humanization service is offered at GenScript to generate humanized antibody maintaining the affinity and specificity of parental antibody and optimized activity, productivity and thermostability. Seamlessly integrated with humanization, the affinity maturation service will continuously improve the affinity by 10 to 50 folds. Extensive experience: GenScript has 10-year experience in antibody engineering for therapeutic and diagnostic development. We have successfully performed 100 antibody humanization projects and 10 affinity maturation projects during the past decade. Multiple strategies to meet the needs: human framework selection, CDR(Complementarity-determining regions) back mutation library screening, etc..
Guaranteed Affinity: The humanized antibody is guaranteed to have comparable binding affinity with parental antibody. The affinity maturation can be integrated to continuously improve the affinity by 10 to 50 folds. 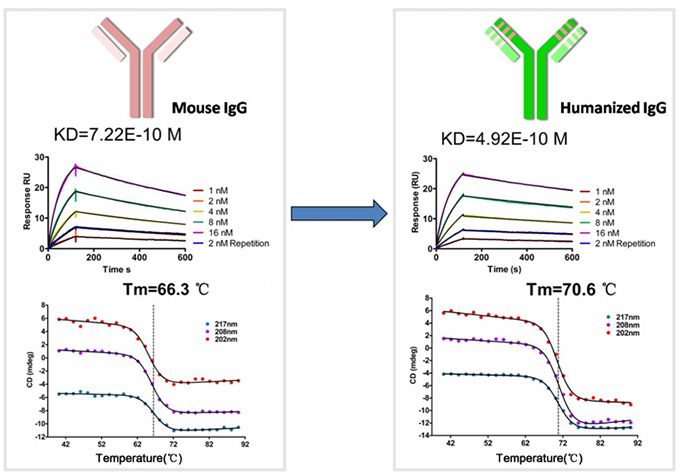 Optimized Physiochemical Properties: FASEBA (FAst Screening for Expression level, Biophysical properties, and Affinity technology) is used to optimize properties of the humanized antibody, such as expression level and thermo-stability, which are important for optimal manufacturing and the in vivo behavior. 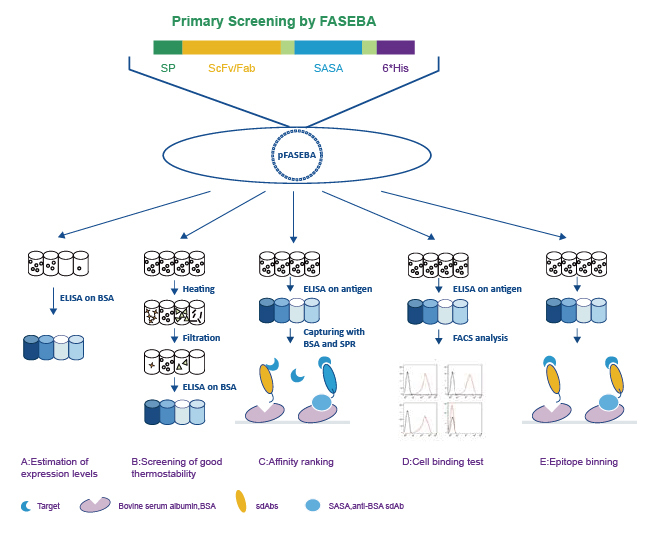 Test in bioassays: binding assays such as using ELISA , Biacore Surface Plasmon Resonance and a suite of biological assays available to support the characterization and selection. Possible to combine with affinity maturation to further improve the affinity by 5-10 fold in <6 months. Please contact us mentioning "Discovery Biology", our customer service representatives are available 24 hours a day, Monday through Friday to assist you.